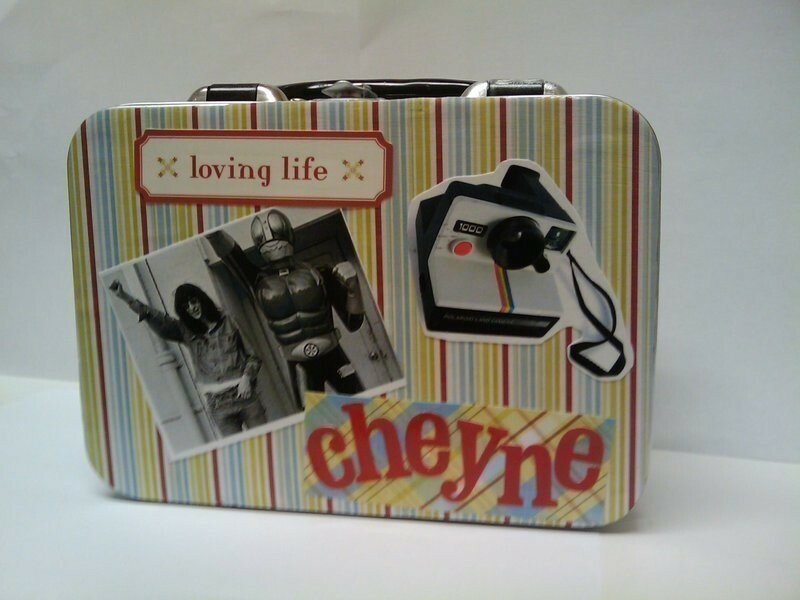 A cute lunchbox tin decorated any which way your heart pleases. 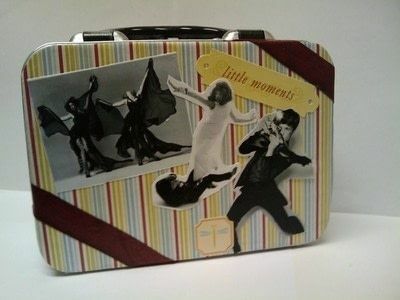 I saw the cutest lunchbox tins at the craft store for less than $8.00 (U.S.). I had different lunchbox tins (with prefabricated designs) that I used as purses but lost/broke them over the years from moving a lot. Let's see...I had an Elvis one, hot rod flames, and a magnetic poetry one. Anyway, I decided to give a personalized one to my dear friend Cheyne, who is a fashion photographer and loves all things retro. P.S. The times are an estimate. I was actually working on all of the embellished projects all at once. While I waited for something to dry, I worked on something else. Mod Podge Scissors Sponge Brush Magazine(s) cutouts, wrapping paper, tissue paper, ribbons, scrapbook paper, stickers, jewels, rickrack, acrylic paint and brushes, spray paint, etc. +Optional: Thin Strip Magnets, e-6000 glue, and toothpicks to adhere any decorations you want inside the lid. 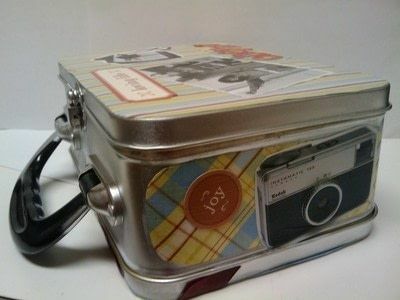 ***You can coat the tin lunchbox with paint or spray paint if you want to change its base colour. If so, wait for the paint to dry according to manufacturer's instructions. Cut out magazine images and lay them out so you know how you want the final product to look. If you want to print out some photos from the internet, you can use matte cardstock so it won't tear while you apply the decoupage glue. Glue the images to where you want. 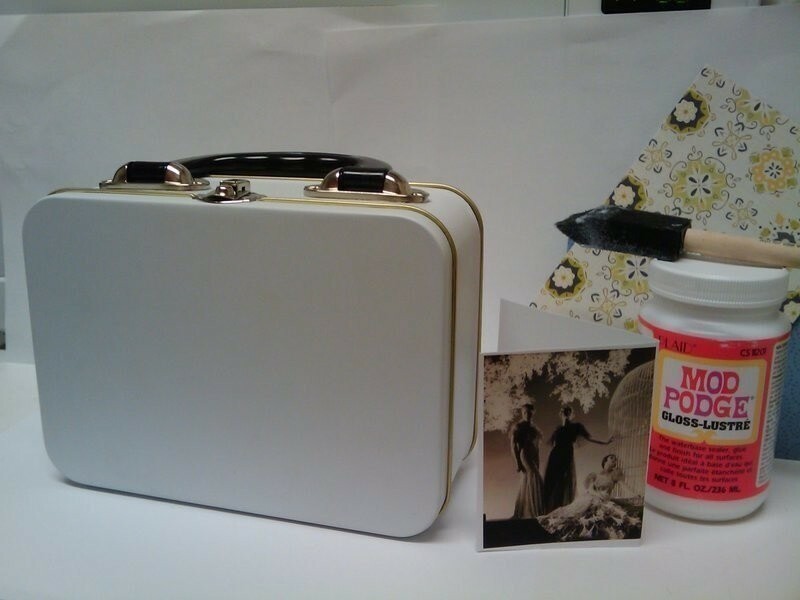 Put another coat of the decoupage glue all over, including the ribbons. 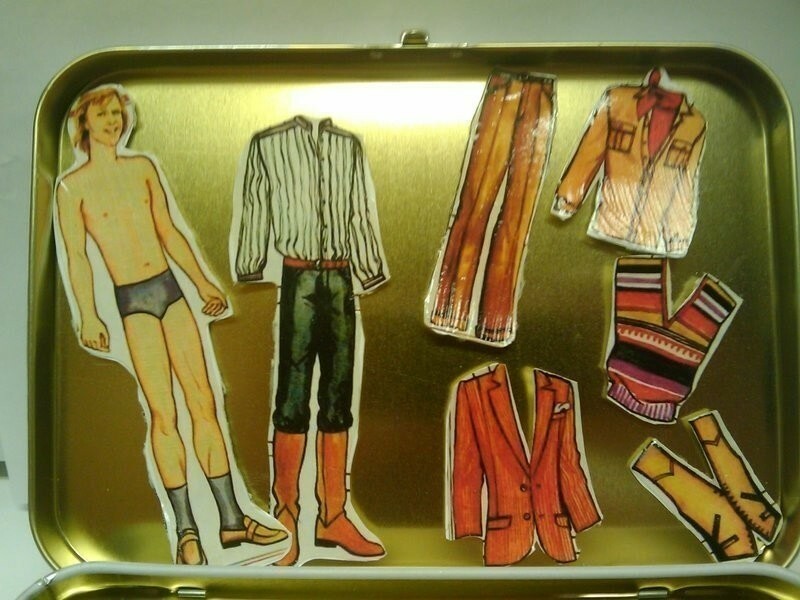 To decorate the inside, I found a 1970s era male paper-doll after doing an image search. I thought it would be appropriate so Cheyne will 'always' have a male model. Hee hee. I resized the images, printed them out on matte cardstock, and cut them out. I glued them with decoupage glue onto more cardstock to make it sturdier. I waited half an hour for it to dry,then coated them with the decoupage glue. After waiting for another hour, I cut all the images out. I cut out the strips of magnets and glued them to the images with e-6000, spreading them out with a toothpick. It took about an hour to dry and so I stuck them onto the inside lid. and i was wondering, can u wash the lunch box or nah? I'm confused about when I use the mod podge? Basically what kind of glue I use when & where.